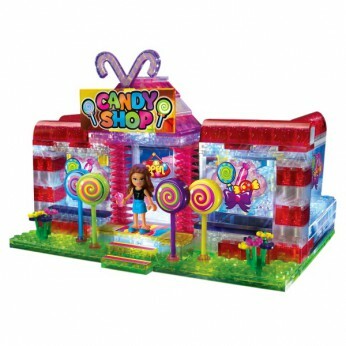 Ava’s light up Candy Shop is full of treats and goodies. It’s the ideal chill out spot to relax and sample some delicious sweet treats. Choose your favourite candy snacks from the counter or gum ball machine. Lite Brix is the Super Building System where you can build light up environments using Lite Brix, connectors, special shaped parts and brick blocks. One supplied; Size H32, W38.5, D6.5cm; Batteries required: 3 x AA (not included). For ages 6 years and over; EAN: 884920357020. WARNING(S): Not suitable for children under 3 years old. This toy costs approximately £39.99 (for the latest and best prices make sure you check our retailer list for the Lite Brix LiteUp Candy Shop above). In our review of Lite Brix LiteUp Candy Shop we classed it as being suitable for ages 3 years, 4 years, 5 years but recommend you check the manufacturer specific advice before purchasing.